As excepted with any Hilton hotel, the Hilton Vilamoura offers a very high standard of accommodation with impeccable service and a fantastic range of leisure facilities. At this hotel, guests can enjoy the best of both worlds, just a short car journey into the centre of Vilamoura whilst still being able to relax in a peaceful setting surrounded by stunning gardens. Furthermore, in close proximity to a selection of the Algarve’s best golf courses, the Hilton Vilamoura makes an unbeatable option for your next golf holiday. It's clear to see that no expense has been spared to create a luxurious hotel in a perfect location to enjoy the fabulous golf on offer in Vilamoura, whilst still being able to take advantage of the excellent bars and restaurants that surround Vilamoura's famous Marina, which is just a ten-minute drive away from the hotel. Guests do not need to miss out on Portugal’s stunning beaches at the Hilton Vilamoura, as the hotel conveniently runs a complimentary shuttle bus service during the summer months to the Falesia Beach which is a five-minute drive away. 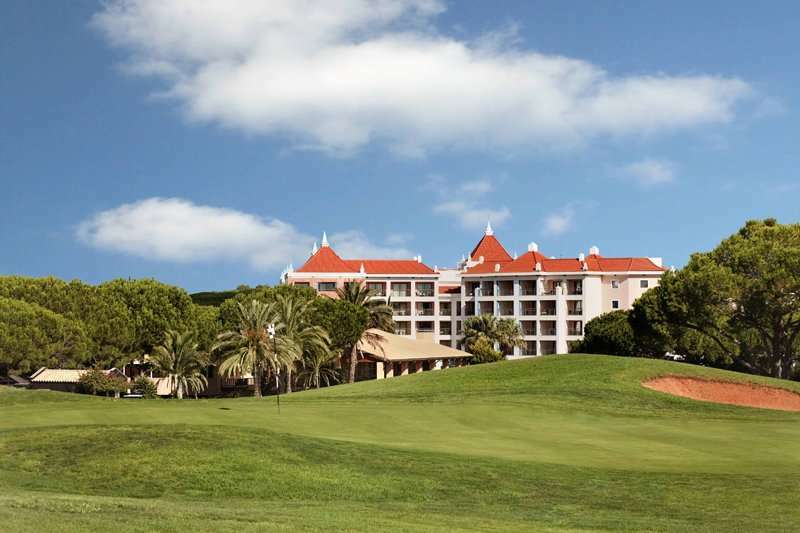 Not only is the Vilamoura Hilton a fantastic option for guests due to its excellent facilities and peaceful location, it is also perfectly positioned to play some of Portugal’s best-known golf courses. The Vilamoura Hilton is located adjacent to the very popular Dom Pedro Pinhal Golf Course, and conveniently for golfers, the hotel offers a free shuttle bus service to and from the local golf courses including the Vilamoura Oceanico courses, Faldo and O'Connor, Vale do Lobo courses and the Quinta do Lago courses. All of the 176 guest rooms at the Hilton Vilamoura are fully equipped with all of the essentials for an unbeatably luxurious stay. The guest rooms and suites come with private balconies so that guests can take full advantage of the hotel’s stunning setting, postioned just opposite to the Dom Pedro Pinhal Golf Course. The hotel also offers its guests 66 spacious one or two-bedroom apartments. All of the rooms are air conditioned and have a spacious lounge area and en suite bathrooms. The hotel’s modern architecture has distinctive Moorish accents with enormous pools, cascading waterways, lakes and grottos. 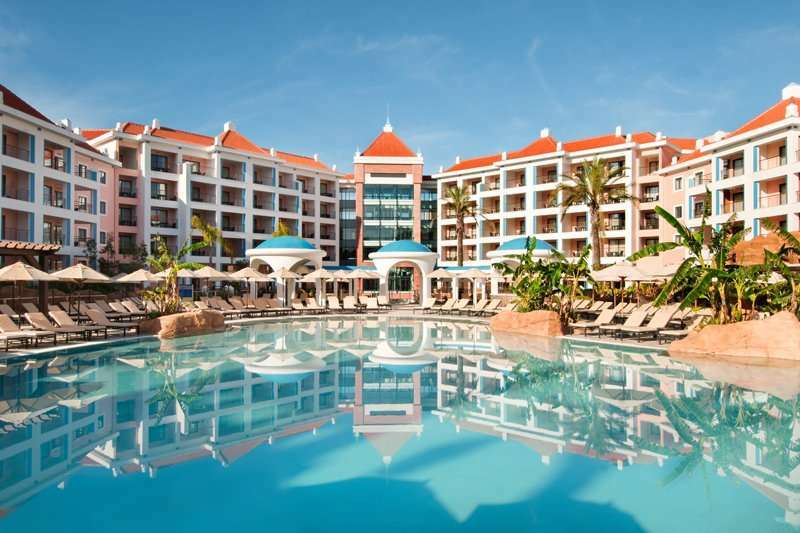 The leisure facilities at the Hilton Vilamoura are nothing less than what one would expect at a five star hotel, and include an impressive six swimming pools lined with sun loungers and parasols. Other leisure facilities include a playground, private tennis courts and a beach club at the nearby Falesia Beach. 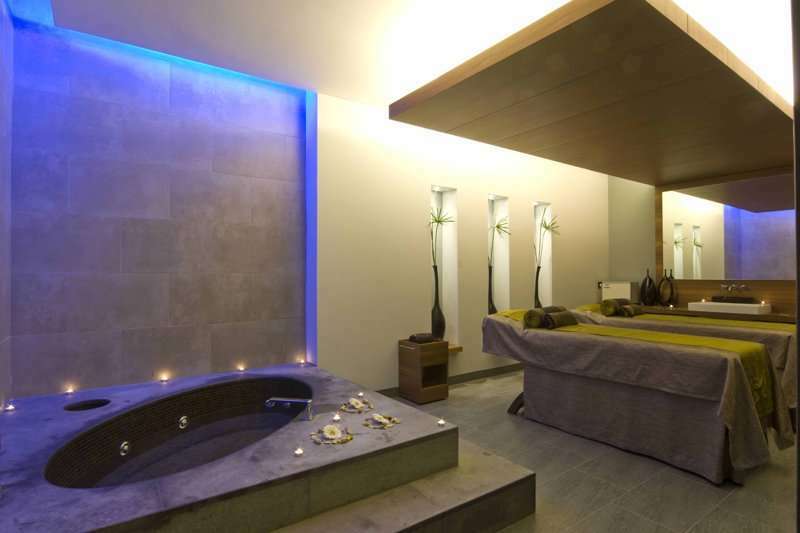 Guests can head to the hotel spa for a range of indulgent treatments, or head to the fully-equipped fitness centre to let off some steam. The Moscada restaurants offers guests a fantastic breakfast and dinner buffet featuring international dishes that can be enjoyed on the terrace. Alternatively, guests can head to the Cilantro or Aquarela a la carte restaurants for a fantastic range of Italian and seafood dishes. The Rubi bar hosts daily evening entertainment and offers an excellent range of cocktails and snacks.